An Autographed Copy to be Given Away Soon! 5:30- Wake up, get dressed, have breakfast and pace floor because I’m so nervous. 7:15- I, along with my husband, brother in law, father in law, mother in law, and husband’s friend all piled into the van and headed an hour and a half away to the course. The whole drive I continued to get more and more nervous. I tried to read to take my mind off of things. 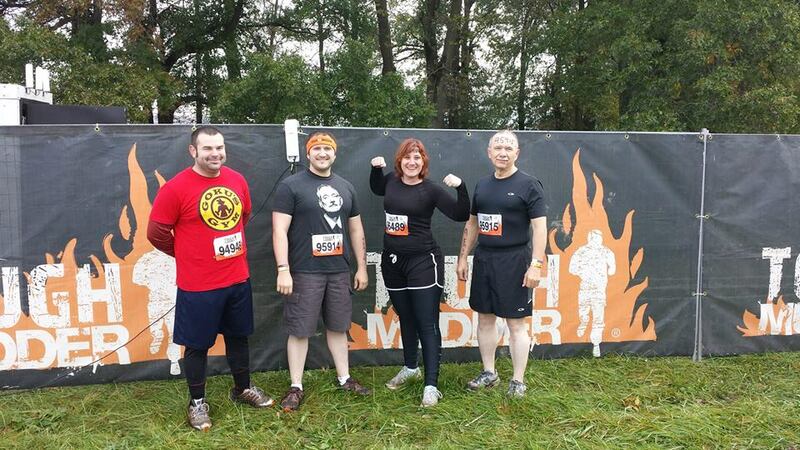 9:00- Arrived at Tough Mudder. Signed in. Collected wrist bands and bib. Then met up with a friend of a friend who was doing it with us. Took a before pic. 10:00- Our start time. A guy went over a few safety rules and then had us do 15 pushups in the mud. (ok I did 10) and then we had to climb a wall that was about 6 feet high before -yes before- the official start line. The guy did a pep talk, got us all worked up and excited then we took off! Here’s a rundown of the obstacles. #1 Creek Crusade: We jogged for about a half mile before we came to this. Basically we waded through a muddy creek for a good quarter mile. The water was very cold. #3 Warrior Carry: This is where you carry your teammate on your back for a small stretch, then switch halfway and they carry you. I wasn’t quite strong enough to carry any of the guys so my husband carried me first then Jon (the friend of the friend) carried me for the other half. #4 Everest: Now normally, this is where you run up a quarter pipe and grab the edge of the wall and pull yourself up or have someone help you up. But I think it was so muddy (we had rain for 2 days before this event) that they had people make human ladders and you had to climb them and the people on top would pull you up. I was so nervous watching the heavier people that would almost fall but they would eventually get up there. Here’s a picture of me getting pulled up. Luckily it didn’t take long. #5 Berlin Walls: These are two walls that are about 8 feet high that you have to climb over. I attempted and didn’t make it because I was too afraid of hurting my foot when I jumped down on the other side. ( When I did the warrior carry and I jumped from Jon’s back, I had that lovely pins and needles feeling in my foot) so I didn’t want to risk hurting it more. #6 Jumpin Bale: These were about 4 hay bales that you had to jump over. Harder than you think but I did it with the help of my team. #7 Walk the Plank: Only me and Jon did this one. My husband and father in law can’t swim so they had to skip it. We climbed up onto a platform about 15 feet above water and jumped into muddy water below. I have to say, I’ve never jumped from anything that high and it was a looooonngg drop. Then when I hit the water and went down, I felt like I would never surface again. It was a little scary and the water was sooo cold. But I did it. #8 Balls to the Wall: All four of us attempted this and didn’t make it over. It was a wall with a knotted rope to climb over but the rope was so muddy it was hard to grasp and my husband actually kind of fell and almost hurt his ankle. Much harder than it looked. #9 Prairie Dog: An easy one. Climb through a little tunnel pipe and pull yourself out into some water at the end. Done and done. 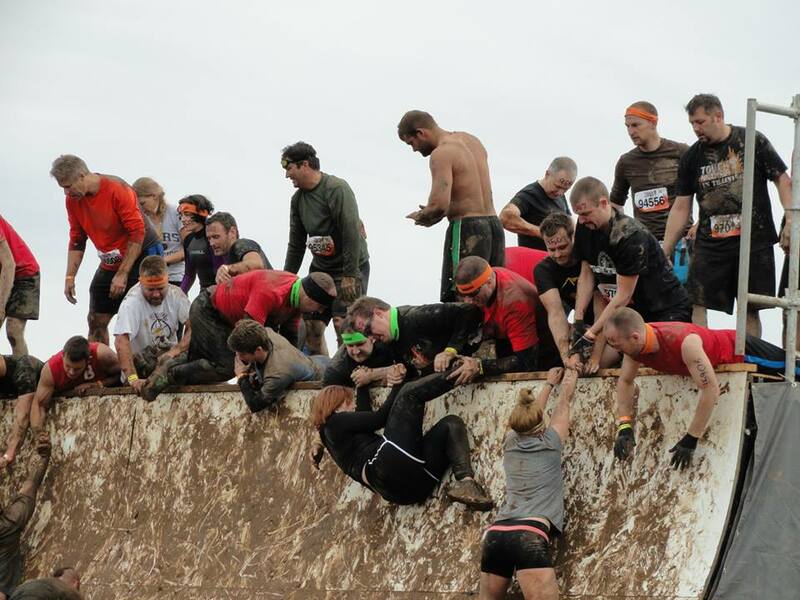 #10 Mudderwheelbarrow: Exactly what it sounds like. Remember those wheelbarrow races you did as a kid. Yup that’s it. But it’s a lot harder when your an adult. I held my husband’s feet while he crawled across the ground and the whole time it reminded me of some weird centipede alien lol. Then he drive to “drive” me and I didn’t make it very far. That requires a lot of core muscle work. Whew! #11 Poledancer: These were poles that went over a small pool of water and they angled up than down and you had to use all upper body to shimmy your way with your hands across. Attempted and quickly failed. #12 Creek Crusade #2: Another little creek adventure. #14 Mud Mile: This was about 4 hills of pure muddiness. You clamber your way up, then slide down into muddy water over and over. I thought it was fun. 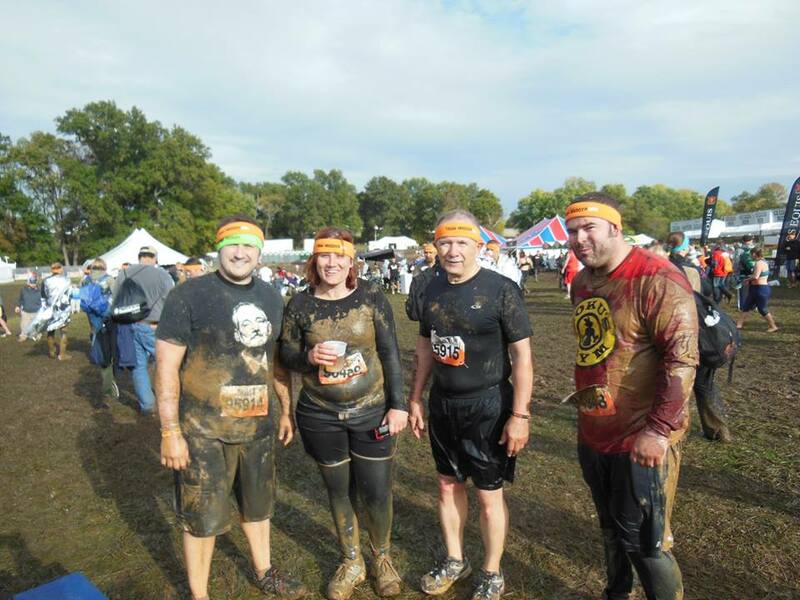 #15 Arctic Enema: I’m sad to say we all skipped this one even though it’s one of the most talked about tough mudder obstacles. But it was so freakin cold and I wanted to finish. We all figured if we jumped into pure ice water (they literally pour bags of ice into a dumpster sized container and you have to jump in, duck under a board in the middle and climb out) we knew we would get leg cramps because we were all on the verge of having them anyway and I really didn’t want to catch hypothermia which I heard someone did. Yes, I chickened out. #16 Jumpin Bale #2: More hay bales but this time we climbed on top and had to jump from hay bale to hay bale and if you fell it was a good 6 feet so luckily none of us did. #18 Glory Blades: These were walls that were angles toward you as you tried to climb so you had nothing to place your feet on to help. It was all upper body and usually your teammates had to help you out. But, again, I was afraid of hurting my foot so I passed these by. 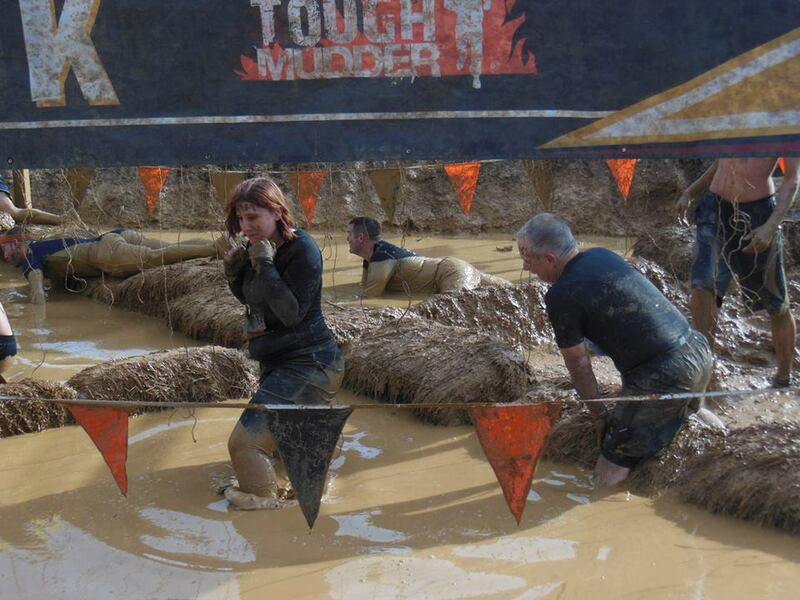 #20 Electroshock Therapy: This is the one I was dreading the entire 10 miles. It’s the last obstacle and the finish line is right there. But you have to go through random live wires that shock you with 10,000 volts of electricity. Usually you run through but they had it set up this time where we kind of had to climb over hay bales in water. I got shocked once on the hip and it definitely surprised me but didn’t really hurt. However, I didn’t want it to happen again so I scurried on out of there. Here’s a pic. It was Thursday, November 27th, 2008 (Thanksgiving!) and I was going to the theater all by myself to see a movie I had already seen two other times. What movie you ask? Oh, uh *cough twilight cough cough*. Yes, I was into that whole faze. Anyway, back to the story. So I’m standing in line at the concession ready to order a soda and popcorn and as I’m waiting, I’m looking around for straws because I didn’t want to look like a fool after I got my soda and trying to find them (sometimes they hide those blasted things!) After I located the straws, a concept started floating in my head. A girl who could spot things very quickly. A girl who could react to things extremely fast. But she wasn’t a superhero or anything. She just had an amazing brain. Long story short, I ended up writing about 2 pages of the story like that and then EVERYTHING changed. I wanted to write a series. And I wanted more abilities. Not just a few. So I started researching telekinesis and all the other kinetics. I got more excited as I looked things up. This is how the story should be. So I scratched the story of the 17 year old girl with the gifted brain and I turned her into a 14 year old girl that would discover she had telekinesis and then (gasp) so much more than that. I knew it would be a four book series and I had the ending played out before the first book was even done.